BVHS shooting threats scare students. CHULA VISTA, Calif. (KGTV) - Two threats to shoot students at Bonita Vista High School spread in a snap on social media Sunday, scaring students and parents, making them wary to go back to class Monday. "It kinda caught fire on Snapchat that's where it spread like wildfire and everyone was talking about it it was everywhere," Bonita Vista High senior Andrew Garcia said. 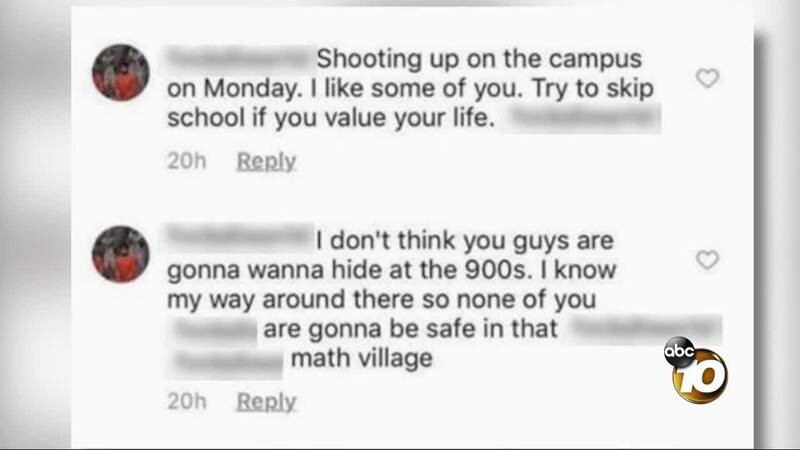 It was a screenshot of an Instagram comment that read, "Shooting up on the campus Monday. I like some of you. Try to skip school if you value your life." Another comment below read, "I don't think you guys are gonna wanna hide in the 900s," apparently referring to the campus' "math village." On Sunday, April 7, 2019 at approximately 1230 hours, the Chula Vista Police Department and officials at Bonita Vista High School were made aware of a threat made against the school. The threat was posted on social media and on the high school’s website. Several students and parents notified Chula Vista Police after seeing the post. Chula Vista Police are actively investigating the threat and at this time have no evidence to substantiate the threat as credible. Police are aware of a second, possibly related threat that was posted following the initial post. The investigation is ongoing, and the Police Department is working closely with the high school administrative staff and the school district on this matter. Bonita Vista High School will be in session on Monday and there will be officers on campus to reassure the students and their families that it is safe to attend school. The Chula Vista Police Department takes any threat made against a school very seriously. The public is encouraged to report any additional information related to this investigation by submitting tips to P3TIPS or by calling San Diego County Crime Stoppers at 888-580-8477. "I was actually, to be honest, I was very scared; like I saw that and I got really concerned," BVHS junior Johnathan Helton said. "No one's going to school for the next couple of days, that's what everyone's saying," Garcia said. "Later on he ended up posting it was a joke, but you never know, that's exactly what the school shooter would say, you know?" Helton said they didn't know who was behind the threat, saying, "They created a fresh Instagram page to post it, and there was only one post and it was a picture of a gun." "It's just people just seeking attention honestly, it;s just a waste of time," Garcia said, shaking his head. "Yeah he could ruin his life if he was just joking with that, like those kind of threats like nowadays people aren't like taking that well at all," Helton said. Another fear weighing on students' minds, turning in homework Monday. "I have a project due first period tomorrow," Helton said.